The Salomon Mountain Lab has done it again, this time it’s the MTN binding with a brake. The brake follows the “simpler is better” philosophy, which is a breath of fresh air for a lightweight ski touring binding. 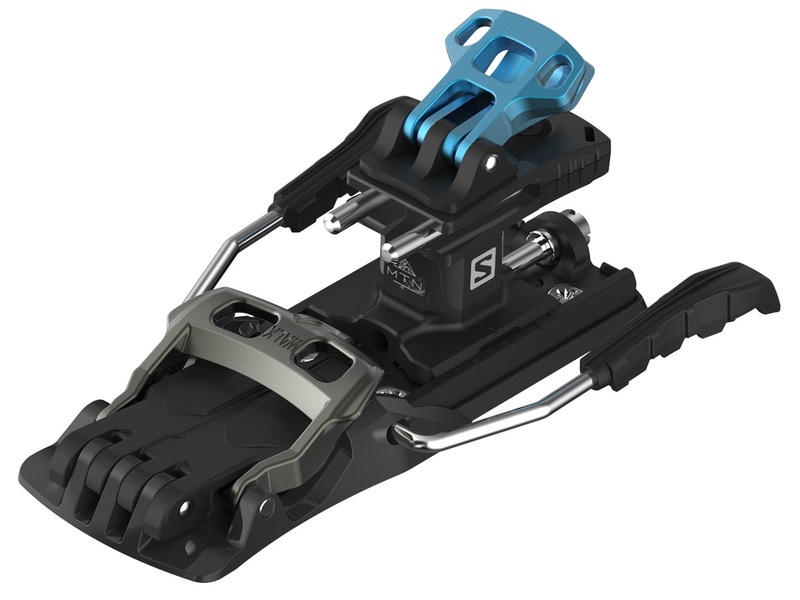 The toe and heel unit feature a wide mounting platform, which gives it stout and aggressive performance on wider powder skis, but because of this it will also readily take control of narrower mountaineering skis without issue. The brake is retracted/deployed with the use of a large lever that folds out of the way when not in use. The toe piece is built out of as few pieces as possible, which contributes to the reliable performance: fewer parts to break, repair, or wear down. A patented Step-In aid guides your boot into the toe piece, but moves out of the way as soon as your boot is in the binding to not impede range of motion on a technical skin-track. An integrated crampon receptor offers rigid attachment for icy spring mornings. The heel housing is sandwiched between a threaded adjustment track and two risers. The housing rotates 90° to expose a flat mode which makes long approaches more natural and efficient. It rotates easily back to ski mode when you’re ready to point it down the fall-line. The risers are strategically machined to reduce unnecessary weight and easily manipulated to offer climbing versatility. 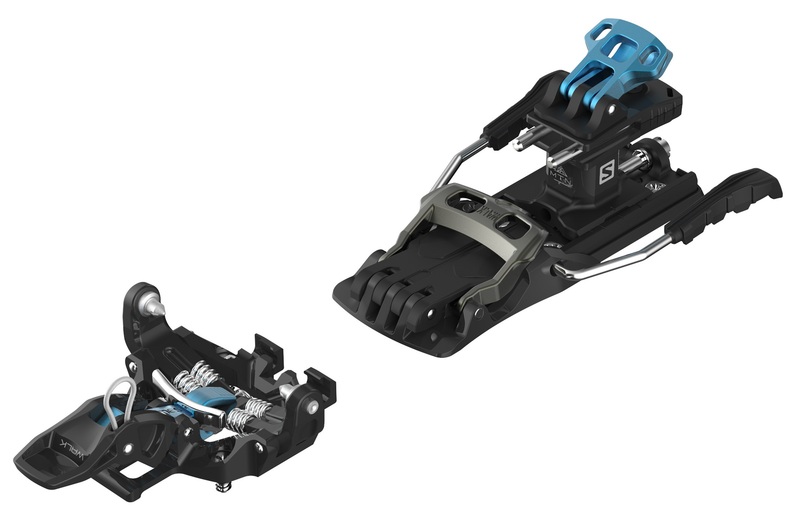 The most unique part about the heel piece is the combination of simplicity and function found in fixed-release race bindings, with the option to install different springs for different release values. The MTN binding comes with three in the box: Women’s, Men’s, and Expert which dictate forward and lateral release values simultaneously. The springs can be changed in a matter of minutes at home. The threaded adjustment track offers a generous 30mm of range so you can accommodate a boot quiver. The MTN binding is the lightweight tech binding for everybody and their mom (Mom’s spring not currently available). 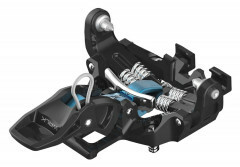 Wide mounting pattern establishes power and sure-footed performance. Three riser options including a flat mode to make approaches more approachable. Three included springs to adjust release value to your preferred setting. Five brake sizes at your disposal: 80mm, 90mm, 100mm, 110mm, and 120mm. Step-In Aid helps you get into the bindings when your heart rate and elevation are sky high. Long toe lever makes it easy to switch modes in a flick. Would you expect a downhill performance difference between the Solomon Mtn Binding and the Dynafit Speed Turn 2.0 on Atomic Backland 107 skis? Eric, No, there would not be any detectable difference in those bindings or any in the 'touring category'. Just got these bindings and I went brakeless for low weight and simplicity. I'm now wondering if there are tips or tricks for swiveling the base 90 degrees to go from hiking/climbing mode into downhill mode with a pole? I've only done it by bending over and using my hand to turn the heel base. Not a big deal, but it's getting harder for this stiff gal to get all the way down there! Anyone figured out a pole technique for turning this? No one had explained to me how the binding with the brake never required swiveling the heel, so I"m now wondering if I should add the brakes? Hi Trish! You don't have to rotate this binding to get into climbing mode. Just flip the flaps over the pins. Is the brake easlily removed and re-installed? Or do you make your brake/brakeless choice up front once and for all? Hi Dane, I wouldn't say that removing the brake is difficult, but it does require complete removal of the heel piece from the ski which could potentially strip the holes if done repetitively. I would suggest making the decision you think you'll be sticking with up front, but know that you can change your mind without too much of a problem. Sounds like quiver killers should be part of the order. thanks! Here's a picture of the Dynafit crampon keeper installed. It'll save the crampon and binding from marring each other up. Can I put 100mm brake on a 103mm waist ski or should I get 110mm brake? I'm guessing that either one works? Hi Will, you can likely make the 100mm brake work, but the standard advice has you going with the 110mm. Love them. Skimo did a great job mounting the heel piece with Quiver killers, so I can easily remove the brakes for days when I'm doing a long tour and don't need or want them. Not quite "easily", as it takes a bit of fiddling and "snapping" the baseplate on or off from the actual binding. But this isn't something I expect to do often, and it's a very nice feature. I though it would be useful for folks considering this binding to recognize that they accept Dynafit, ATK *AND* Plum crampons. The great thing about the Plum crampons is that they drop in from the top, rather than slide from the side. Much easier, and far more secure, and less prone to icing. So the brakes are removable? Hey Andrew! Removable is kind of a funny word for it, but this binding does come with hardware for both braked and brakeless operation. The heel piece sits on a either a brakeless or a braked plate, so you have to unmount the binding to swap one way or the other. I wouldn't call it "removable", but maybe more "compatible" with either style of operation. Here is the brakeless baseplate. And a 110mm braked baseplate. Hey Ansel! Yup, you got it! The braked version is basically the brakeless version, minus the leash, plus an extra set of braked baseplates. Hey Snow, thanks for reaching out! You're right, that large throw lever does create a pretty solid platform to stand on, which increases the height (it measures about 28mm off the top sheet, fyi), but the toe piece itself is pretty low to the ski. The Radical 2.0 heel in flat mode measures about the same height actually (it's just shy of 29mm off the top sheet) but the toe is much, much taller than the MTN binding.